Fridge magnets! Are there ever enough? I make these little babies from metal bottle caps and magnets strong enough to pull the proverbial fillings out of your teeth. The bottle caps come from pop (soda), beer, and hard cider beverages that my family and friends happen to be drinking. The caps have been thoroughly washed before reuse. 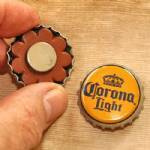 The back of the cap is filled with a leather spacer and a super-strong magnet. Since the caps are used, some may show slight signs of wear, but I am picky about choosing caps that look as good as possible. The bottle caps in each set will all be different unless you tell me otherwise. Put a message in the Notes section if you have a general preference (local brews from the upper Midwest, craft brews in general, national brands, non-alcoholic, etc.) I will do my best to choose accordingly. If you have bottle caps of your own that you want to turn into magnets, I'll do it! Wash them thoroughly to remove drink residues and send 'em to me. Same price as shown below.